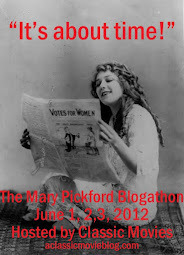 Ever since the Mary Pickford blogathon--which was itself inspired by the increasing mentions of her in the media--it seems like Mary has been riding an ever-growing wave of popularity. In the past couple of months in particular, there's been so much buzz about her. Writer, editor and film historian Christel Schmidt has been touring the country in support of her wonderful new book, Mary Pickford: Queen of the Movies (which I reviewed a few weeks ago). She was kind enough to push aside her jet lag and spend a couple of hours chatting with me when she visited Seattle last week. Schmidt was in town to present a screening of Sparrows (1926), Pickford's penultimate silent flick. It was an awesome conversation, and I can't wait to share what I learned with you all. It may need to be a two-parter! The movie was presented at the SIFF Film Center (a venue change from the theater in the photo), and the screening sold out on a rainy Tuesday evening. Pickford power! I felt sorry for those who got turned away at the door, because it was an amazing show. Schmidt opened with a few remarks and the crowd was clearly impressed by Mary's accomplishments. I loved hearing the laughs and gasps of astonishment, because Schmidt did a headcount at some point, and found out that about half the audience was seeing a Pickford film for the first time. I think she, and Mary, won some new converts that night. The evening started with a lively early IMP short featuring Mary at age seventeen. She was charismatic, loveable and clearly a star from the beginning. It was also interesting to see the original trailer for Sparrows. They used to be so beautiful--not to mention dramatic. Then the main feature, and oh my goodness, I don't know how many times I've seen Sparrows--it's my favorite Pickford flick, so I've watched it a lot, but it always feels like the first time whenever I see this movie. All the tears, tension and laughs remain fresh, and so much of that is due to Mary. I also can't speak highly enough of seeing silent films in the theater. It is a totally different experience. The audience is so much more respectful, and always incredibly involved. There's dead silence in between the laughs, sniffles and hisses (I love how much people get into booing the villain). That doesn't ever seem to happen in movie theaters anymore. Of course, a lot of the atmosphere was thanks to Dan Redfield, who performed his own score for Sparrows on the keyboard. He did a fantastic job, particularly in the action scenes, where he managed to make me exponentially more nervous than I usually am when Mary drags those orphans through the swamp. I was also pleased to see that Mary Pickford: The Muse of the Movies is now available on Netflix Instant Play. It's been great to see the recent Twitter buzz for the movie--especially from viewers new to Pickford who are now interested in checking out her films. Filmmaker Nicholas Eliopoulos is such a nice guy, and he pays great tribute to her accomplishments and spirit, often letting her tell the story in her own words via audio from various interviews. Check it out. I also reviewed the film here. As regular readers may know, I tend to be skeptical of biopics, but I'm making a huge exception for The First, the Mary Pickford bio. now in production. It sounds like everyone involved cares deeply about getting Pickford's story right, including co-producer Dominick Fairbanks, Douglas Fairbank's grandson. And you can't do better for source material than Eileen Whitfield's detailed biography, Pickford: The Woman Who Made Hollywood. It's also encouraging to see that so far the casting, and especially Lily Rabe as Ms. Mary herself, has been solid. It was recently announced that Julia Stiles will play screenwriter and Pickford pal Frances Marion. I don't know what to think of that, but I wouldn't be surprised if Stiles could pull it off. You can see photos of Rabe, co-star Michael Pitt and producers Julie Pacino and Jennifer DeLia in this gallery from the The First premiere party celebrating the film's production at the 2012 Toronto International Film Festival last September. Wouldn't that have been a fun party? I've got to say it again Pickford power! Mary is breaking out in a big way. It's about time. I enjoyed your post, KC! I don't think I've ever seen a Mary Pickford film -- what a special experience to see it in a theater. I added the documentary to my Netflix queue. My first Pickford film was another presentation of Sparrows in a theater with live music. I'm sure that helped to get me hooked, but I also highly recommend "Sparrows" as a first Pickford film. Definitely watch the documentary first though!